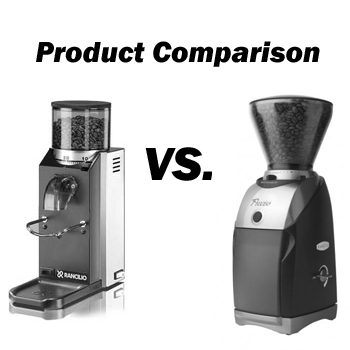 Synopsis: We compare the good, bad and ugly in regards to comparing the Rancilio Rocky grinder and the Baratza Preciso grinder. This is a question we get asked ALL the time, and rightly so. We always say grinder, grinder, grinder.... so you're in the market for an espresso grinder that will give you the most adjustment and flexibility but will last forever (through three world wars forever) for the least amount of money possible. The answer, in regards to grinders, is that you truly get what you pay for. So, when comparing spec to spec, the Rancilio Rocky looks like the winner. However, the results are varied in the eyes of the user. Only YOU can decide what is most important. Sure, the Rocky is made in Italy and has Flat Burrs but the grind comes out very clumpy at a fine grind and the lack of adjustment is a HUGE issue for most home coffee geeks. What is more important to you; Durability or Grind Quality? If your answer is durability, we would say go for the Rancilio Rocky. If your answer is grind quality, we would say go for the Baratza Preciso. The Rocky is a great grinder but lacks technology while the Preciso is also a great grinder with new technology and better grind quality, it lacks durability. There is no right or wrong clear cut choice here. You need to decide what is more important and that’s what we are here for. To make sure that you leave our store with the grinder that best suits YOUR usage and needs. Give us a call if you’re still unsure as to what will work better for you and we can help. This review is fair. As a buying guide, it’s a notch above the usual echo chamber. One important issue to me that the comparison did not mention is grinds left in the grinder. The Preciso has very few remaining grinds. I owned the Rancilio Rocky (for 2 weeks), before returning it. Between the extra bad clumping, lack of fine-tuning of the grind, and gobs of grinds left in the grinder I found it inadequate for espresso…but it’s built so well your kids and grand kids will be able use it to pull pitiable shots too. One thing this review got wrong, the Preciso is not a belt drive. I wish it was! Thanks for pointing this out and for the great feedback.